The Aston Martin is arguably one of the most beautiful cars in the world and like the Jaguar XKE has a design that has been described as timeless. It might seem incredulous, but after thinking about this for quite some time, I was about to dramatically change how the car looks. My biggest concern? Just don't screw it up! Aston Martin has shown that this design is not immune to contrasting accent colors. Note the contrast color accents optioned on the current (2016) Vantage GT. (photograph below) I must admit that the car looks pretty damm good. But it was criticized by some for being "attention grabbing" My opinion however, (and my opinion only) is that I am not a fan of the lipstick treatment of the front grill; I am ambivalent about the accent color up the windshield posts. Finally the side "GT" stripes were a bit too much for me. I am aware that Aston Martin has highly talented designers, however I believed I could implement an accent color scheme that I LIKED better. In deciding to individualize my car the goal was to stay true to my individual taste, and not to please everybody because you can't. The plan then was to implement a color scheme that I found to be bold and reflected my taste. One thing we all have to realize is that not everyone is going to like what you have done. (My wife was non-committal, except to say "Its your car") However I believe it’s important to stay true to one’s individual taste even if some might find it somewhat controversial. 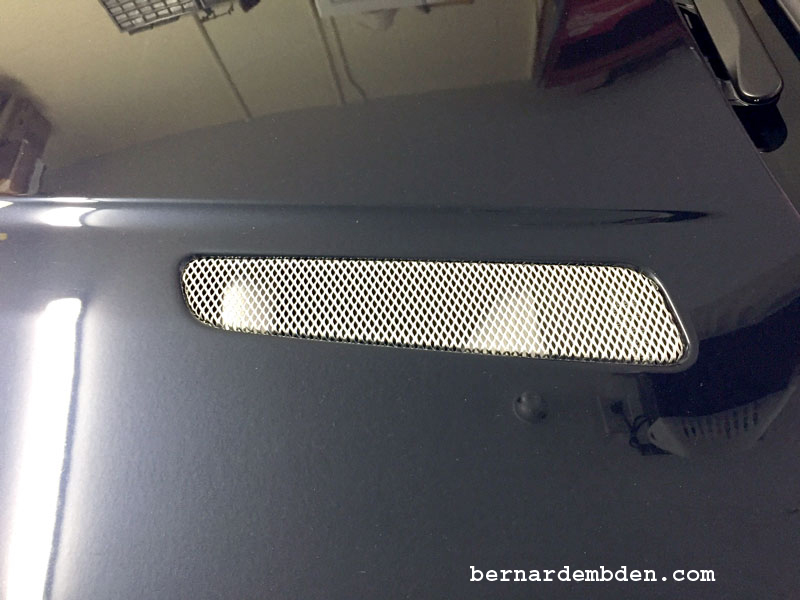 As I examined my car, the plan was to add a V-12 style front grill and accentuate the grill, hood vents, and side strakes and to balance the front do something with the lower bumper valance. The theme would continue on the side with mirror caps and changing the brake caliper color from red to the accent color. From the rear of the car the lower diffuser bar was added to the list of items to accept the accent color change. There was one problem with my plan. The red brake calipers. I really liked the red calipers. I liked them a lot as they contrast strikingly with the car's dark blue color. I decided to keep the red calipers and to color balance the side view of the car I would add the accent color to the disc brake rotor hats. The issue is always to recognize when how much change is too much. The difference between tastefully individualizing your car and pimping your ride is a narrow one indeed. 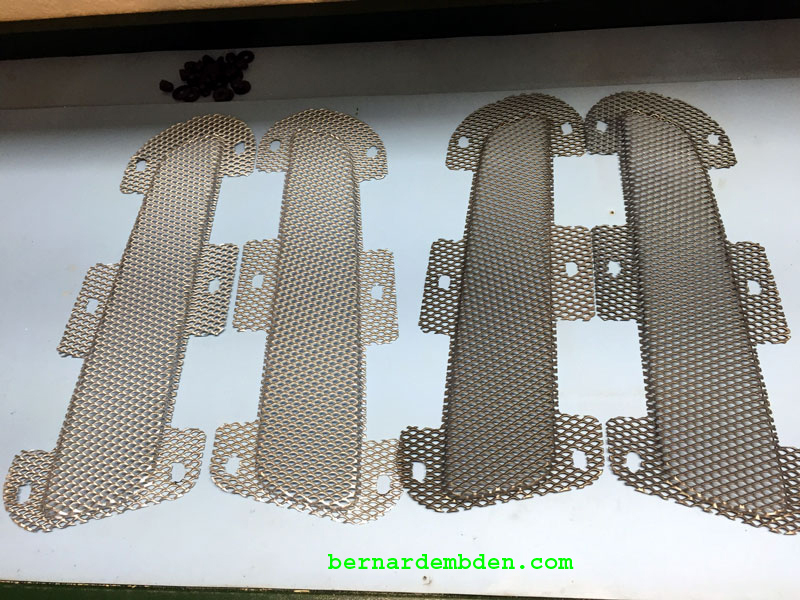 I ordered a V-12 style front grill from V-Collection and the die was cast. This grill is only considered a bargain when compared to the V-12 grill from Aston Martin. For the price this thing should be gold plated. The challenge now was choosing an accent color. The paint color on my car is Orient Blue, essentially a dark blue that appears blue-black when in direct sunlight. Yellow was the obvious choice, but I discarded that choice because it was not "deep" enough. I wanted a color closer to yellow/gold. Most body shops distain this kind of work, an obsessive customer, no great profit and the potential for disaster. I was fortunate to find a body shop that was willing to work with me on creating a color that I wanted. We started with a Dodge yellow and added stuff until it "looked good on the stick"
I purchased new side mirror caps from Volvo. I then removed the hood and side strake grills, the rear lower diffuser bar, the mesh backing from the V-12 grill (I only needed the grill frame) and the lower front bumper valence and was off to the body shop. In the interim the rotor hats project was started by carefully sanding of the areas to be painted. The custom yellow/gold paint would not stand up to the rotor heat, so I used yellow high temperature brake caliper paint. The paint is not as deeply yellow/gold as the custom paint, but was close enough to balance the side view of the car. The paint line was extended up to the lower edge of the rotor next to the pad wear surface so it would be visible through the wheel spokes. Three coats of high temperature primer, four coats of high temperature yellow and three coats of high temperature clear. Three days later I picked up the painted pieces from the body shop. Two days and skinned knuckles later and the pieces were installed on the car. Below are photographs of the painted side strake vents, rear diffuser bar and front and rear rotor hats. As I looked at the completed car I slowly realized that too much of a good thing (yellow) became, well too much! After a lot of consideration I came to the conclusion that the painted hood mesh (grills), along with the yellow mirror caps had to go. They detracted from the front of the car. I still did not like the color of the original hood mesh. Note that the hood mesh comes in two distinct colors. The original mesh that came with the car is called Platinum and is a dark color. The other option is called Magnum Silver, and as the name suggests, is bright silver in color. (Inexplicitly, it also costs twice as much). With the hood mesh changed to Magnum Silver and the mirror caps changed back to Orient Blue, the car finally looked the way I envisioned it. The yellow accent added to the appeal, not overpowered it. The most important factor is that the owner likes the completed car. The accent color I thought was exactly right for the car, the front bumper valance helped to balance the front grill. Below are photographs of the completed car. If you are personalizing your car so everyone will like it you will be bitterly disappointed. You might as well leave the car as it is from the factory and not change anything. People are individuals, not everyone will like or approve of your taste. When individualizing ones car the challenge is to create something that fits the car, hopefully is done tastefully but far more important I believe the car should reflect the owner’s personality. In my opinion the owner should believe it fits the car, believe it’s done tastefully and that the owner not only admires it but really likes it. Then, from the owners point of view, the project is successful.